Lazarus Rising or Icarus Falling? The GoPro and LinkedIn Question! As I watch GoPro and LinkedIn, two high flying stocks of not that long ago, come back to earth my mind is drawn to two much told stories. The first is the Greek myth about Icarus, a man who had wings of feathers and wax, but then soared so high that the sun melted his wings and he fell to earth. The other is that of Lazarus, who in the biblical story, is raised from the dead, four days after his burial. As investors, the decision that we face with GoPro and LinkedIn is whether like Icarus, they soared too high and have been scorched (perhaps permanently) or like Lazarus, they will come back to life. GoPro: Camera, Smart Phone Accessory or Social Media Company? GoPro went public in June 2014 at $24/share and quickly climbed in the months following to hit $93.85 in October of that year. When I first valued the company in this post, the stock was still trading at more than $70/share. Led by Nick Woodman, a CEO who had a knack for keeping himself in the public eye (not necessarily a bad thing for publicity seeking start up), and selling an action camera that was taking the world by storm, the company’s spanning of the camera, smartphone accessory and social media businesses seemed to position it to conquer the world. Even at its peak, though, it was clear the competitive storm clouds were gathering as other players in the market, noting GoPro’s success, readied their own products. In the last year, GoPro lost much of its luster as its product offerings have aged and sales growth has lagged expectations. It is a testimonial to these lowered expectations that investors were expecting revenues to drop, relative to the same quarter in the prior year, in the most recent quarterly earnings report from the company. The company reported that it not only grew slower and shipped fewer units than expected in the most recent quarter, but also suggested that future revenues would be lower than expected. While the company’s defense was that consumers were waiting for the new GoPro 5, expected in 2016, investors were not assuaged. The stock dropped almost 20% on the news, hitting an all-time low of $9.78, right after the announcement. To evaluate how the disappointments of the last year have impacted value, I went back to October 2014, when I valued the stock at $30.57. Viewing it as part camera, part smart phone and part social media company (whose primary market is composed of hyper active, over sharers), I estimated that it would be able to grow its revenues 36% a year, to reach about $10 billion in steady state, while earning a pre-tax operating margin of 12.5%. Revisiting that story, with the results in the earnings reports since, it looks like competition has arrived sooner and stronger than anticipated, and that the company’s revenue growth and operating margins will both be more muted. 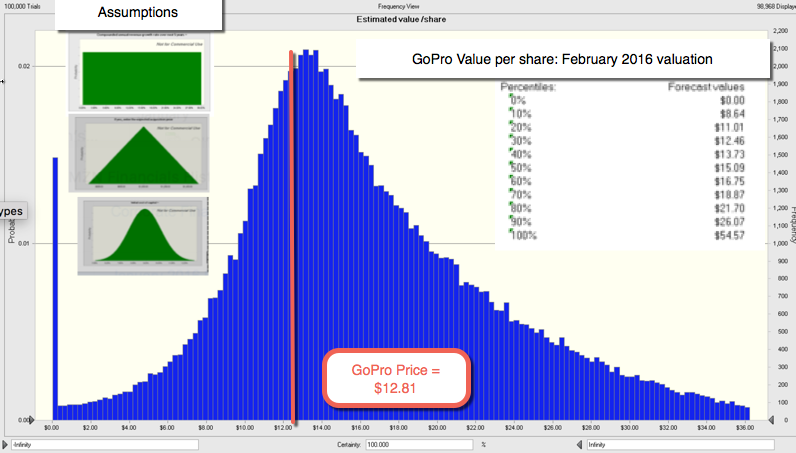 At its price of $12.81, there is a 68% chance that the stock is under valued, at least based on my assumptions. I am fully aware of the risks embedded in this valuation. The first is that as an electronics hardware company that derives the bulk of its sales from one item, GoPro is exposed to a new product that is viewed as better by consumers, and especially so if that new product comes from a company with deep pockets and a big marketing budget; a Sony, Apple or Google would all fit the bill. The second is that the management of GoPro has been pushing a narrative that is unfocused and inconsistent, a potentially fatal error for a young company. I think that the company not only has to decide whether its future lies in action cameras or in social media and act accordingly, but it also has to stop sending mixed messages on growth; the stock buyback last year was clearly not what you would expect from a company with growth options. Linkedin: The Online Networking Alternative? While it often lumped up with other social media companies, Linkedin is different at two levels. The first is that it is less dependent on advertising revenues than other social media companies, deriving almost 80% of its revenues from premium subscriptions that it sells its customers and from matching people up to jobs. The second is that its pathway to profitability has been both less steep and speedier than the other social media companies, with the company reporting profits (GAAP) in both 2013 and 2014, though they did lose money in 2015. Linkedin delivered earnings and revenue numbers that were higher then expectations and much of the negative reaction seems to have been to the guidance in the report. While I have not valued Linkedin explicitly on this blog for the last few years, it has been a company that has impressed me for a simple reason. Unlike many other social media companies that seemed to be focused on just collecting users, Linkedin has always seemed more aware of the need to work on two channels, delivering more users to keep markets happy and working, at the same time, on monetizing these users in the other, for the eventuality that markets will start wanting more at some point in time. Its presence in the manpower market also means that it does not have to become one more player in the crowded online advertising market, where the two biggest players (Facebook and Google) are threatening to run up their scores. Nothing in the latest earnings report would lead me to reassess this story, with the only caveat being that the drop in earnings in the most recent year suggests that profit margins in the manpower business are likely to be smaller and more volatile than in the advertising business. 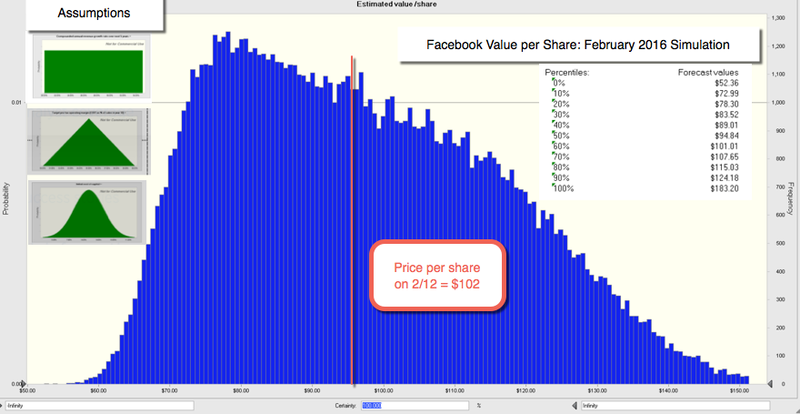 At its current stock price, there is about a 40% chance that the company is under valued. 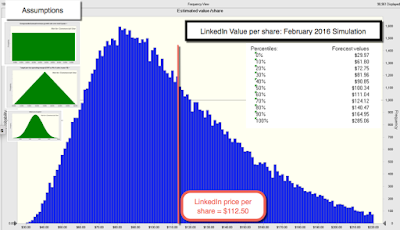 If you have wanted to hold LinkedIn stock, and have been put off by the pricing, the price is tantalizingly close to making it happen. As with other social media companies, LinkedIn’s user base of 410 million and their activity on the platform are the drivers of its revenues and value. If you are already invested in GoPro or LinkedIn, one reason that you may have is that there will be someone out there, with deep pockets, who will acquire the firm, if the price stays where it is or drops further, thus putting a floor on the value. That is not an unreasonable assumption but to me, this has always been fool's gold, where the hope of an acquisition sustains value and the price goes up and down with each rumor. I have seen it play out on my Twitter investment and I do think it gets in the way of thinking seriously about whether your investment is backed by value. That said, I do think that having an asset or assets that could be more valuable to another company or entity does increase the value of a company. It is akin to a floor, but it is a shifting floor, and here is why. Consider LinkedIn, a company with 410 million users. Even with the drop in market prices of social media companies in the last few months, the market is paying roughly $80/user (down from about $100/user a couple of years ago). You could argue that an acquirer would be a bargain, if they could acquire LinkedIn at $8 billion, roughly $20 a user. However, the price that an acquirer will be willing to pay for LinkedIn users will increase if revenues are growing at a healthy rate and the company is monetizing its users. You may be surprised by how small the effect of introducing an acquisition floor has on value but it reflects two realities. One is my assumption that the expected acquisition price is $8 billion; raising that number towards the current market capitalization of $15.4 billion will increase the effect. The other is my assumption that the acquisition price will slide lower, if LinkedIn's revenue growth and operating profitability lag. As noted earlier, unlike many other social media companies, it is not just an online advertising company. The other business (networking and manpower) that the company operates in is appealing both because of its size, and the nature of the competition. The top management of LinkedIn has struck me as more competent and less publicity-conscious that those at some other high profile social media companies. I think it is good news that I had to think a few minutes about who LinkedIn's CEO was (Jeff Weiner) and check my answer. I have a sneaking suspicion that my biases did affect my inputs for both companies, making me more pessimistic in my GoPro inputs and more optimistic on my LinkedIn values. That said, the values that I obtained were not in keeping with my preconceptions. In spite of my inputs, GoPro is significantly under valued and in spite of my implicit attempts to pump it up, LinkedIn does not make my value cut. Put differently, the market reaction to the most recent earnings report at LinkedIn was clearly an over reaction, but it just moved the stock from extremely over valued, on my scale, to close to fair value. Race to the top: The Duel between Alphabet and Apple! Management Matters: Facebook and Twitter! I am not a big user of social media. I have a Facebook page, which I don’t visit often, never respond to pokes and don’t post on at all. I tweet, but my 820 lifetime tweets pale in comparison to prolific tweeters, who tweet that many times during a month. That said, I have been fascinated with, and have followed, both companies from just prior to their public offerings and not only have learned about the social media business but even more about my limitations in assessing their values. The paths that these companies have taken since their public offerings also offer illustrative examples of how markets assess and miss-assess these companies, why management matters, and the roller coaster ride that investors have to be willing to take, when they make bets on these companies. The market’s reaction to this mostly positive report was positive, with the stock rising 14% in the after market. I first valued Facebook a few weeks ahead of its IPO and again at the time of its IPO at about $27/share, laughably low, given that the stock is close to $100 today, but reflecting the concerns that I had on four fronts: whether it could keep user growth going, given that it was already at a billion users then, whether it could make the shift to mobile, as users shifted from computers to mobile phones and tablets, whether it could scale up its online advertising revenues and whether it could continue to earn its high margins in a business fraught with competition. The company, through the first four years of its existence has emphatically answered these questions. It has managed to increase its user base from huge to gargantuan, it has made a successful transition to mobile, perhaps even better than Google has, and it has been able to keep its unusual combination of revenue growth and sky-high margins. Prior to the prior year's last earnings report, in November 2015, I was already seeing Facebook as potentially the winner in the online advertising battle with Google and capable of not only commanding a hundred billion in revenues in ten years but with even higher margins than Google. The value per share of almost $80/share, that I estimated for the company in November 2015, reflects the steady rise that I have reported in my intrinsic value estimates for the company over the last five years. If anything, the story is reinforced after the earnings report, with revenue growth coming in at about 44% and an operating margin of 51.36%. At the prevailing price of $102/share, the stock was close to fairly priced on February 12, at least based on my inputs. I am sure that there will be others who will put Facebook under a microscope to find its formula for success, but there are two actions that are illustrative of the company’s mindset. The first was its aforementioned conquest of the mobile market, where it badly lagged its competitors at the time of it IPO. Rather than find excuses for its poor performance, the company went back to the drawing board and created a mobile version which not only improved user experience but provided a platform for ad revenues. The second was the company’s acquisition of Whatsapp, an acquisition that cost the company more than $20 billion and provoked a great deal of head scratching among value minded people at time, since Whatsapp had little in revenues and no earnings at the time. I argued at the time that the acquisition made sense from a pricing perspective, since Facebook was buying 450 million Whatsapp users for about $40/user, when the market was pricing these users at $100/user. That acquisition may have been driven by pricing motivations but it has yielded a value windfall for the company, especially in Asia and Latin America, with more than 100 million Whatsapp users just in India. It is true that Facebook’s latest venture in India, Free Basics, where it had partnered with an Indian telecom firm to offer free but restricted internet service, has been blocked by the Indian government, but it is more akin to a bump in the road than a major car wreck. At the risk of rushing in where others have been burned for their comments, I am cynical enough to see both sides of the action. Much as Facebook would like to claim altruistic motives for the proposal, the restriction that the free internet use would allow you access only to the portion of the online space controlled by Facebook makes me think otherwise. As for those who opposed Free Basics, likening Facebook’s plans to colonial expansion is an over reach. In my view, the problem with the Indian government for most of the last few decades is not that it's actions are driven by knee jerk anti-colonialism, but that it behaves like a paternalistic, absentee father, insisting to its people that it will take care of necessities (roads, sewers, water, power and now, broadband), while being missing, when action is needed. On a personal note, I was lucky to be able to buy Facebook a few months after it went public at $18, but before you ascribe market timing genius to me, I sold the stock at $45. 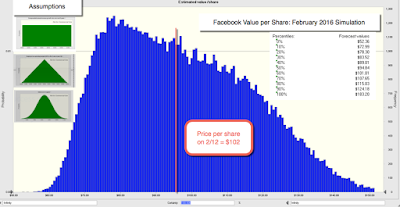 At the time, Tom Gardner, co-founder of Motley Fool and a person that I have much respect for, commented on my valuation (on this blog) and suggested that I was under estimating both Facebook's potential and its management. He was right, I was wrong, but I have no regrets! The market reacted badly to the stagnant user base (though 320 million users is still a large number) and Twitter’s stock price hit an all time low at $14.31, right after the report. The positive earnings may impress you, but remember that this is the reengineered and adjusted version of earnings, where stock based compensation is added back and other sleights of hand are performed to make negative numbers into positive ones. As with Facebook, I first valued Twitter in October 2013, just before its IPO and arrived at an estimate of value of 17.36 per share. My initial narrative for the company was that it would be successful in attracting online advertising, but that its format (the 140 character limit and punchy messages) would restrict it to being a secondary medium for advertisers (thus limiting its eventual market share).The stock was priced at $26, opened at $45 and zoomed to $70, largely on expectations that it would quickly turn its potential (user base) into revenues and profits. However, in the three years since Twitter went public, it is disappointing how little that narrative has changed. In fact, after the most recent earnings report, my narrative for Twitter remains almost unchanged from my initial one, and is more negative than it was in the middle of last year. My estimate of value today is lower than my valuation in August of last year, when I assumed that the arrival of Jack Dorsey at the helm of the company, would trigger changes that would lead to monetization of its user base. So what’s gone wrong at Twitter? Some of the problems lie in its structure and it is more difficult to both attract advertising and present that advertising in a non-intrusive way to users in a Tweet stream. (I will make a confession. Not only do I find the sponsored tweets in my feed to be irritating, but I have never ever felt the urge to click on one of them.) Some of the problems though have to be traced back to the way the company has been managed and the choices it has made since going public. In my view, Twitter has been far too focused on keeping Wall Street analysts happy and too little on building a business. Initially, that strategy paid off in rising stock prices, as analysts told the company that the game was all about delivering more users and the company delivered accordingly. The problem, though, is that users, by themselves, were never going to be a sufficient metric of business success and that the market (not the analysts) transitioned, in what I termed a Bar Mitzvah moment, to wanting to see more substance, and the company was not ready. Can the problems be fixed? Perhaps, but time is running out. With young companies, the perception of being in trouble can very easily lead to a death spiral, where employees and customers start abandoning you for greener pastures. This is especially true in the online advertising space, where Facebook and Google are hungry predators, consuming every advertising dollar in their path. I have said before that I don’t see how Jack Dorsey can do what needs to be done at Twitter, while running two companies, but I am now getting to a point where I am not sure that Jack Dorsey is the answer at Twitter. As someone who bought Twitter at $25 late last year, I am looking for reasons to hold on to the stock. One, of course, is that the company may be cheap enough now that it could be an attractive acquisition target, but experience has also taught when the only reason you have left for holding on to a stock is the hope that someone will buy the company, you are reaching the bottom of the intrinsic value barrel. 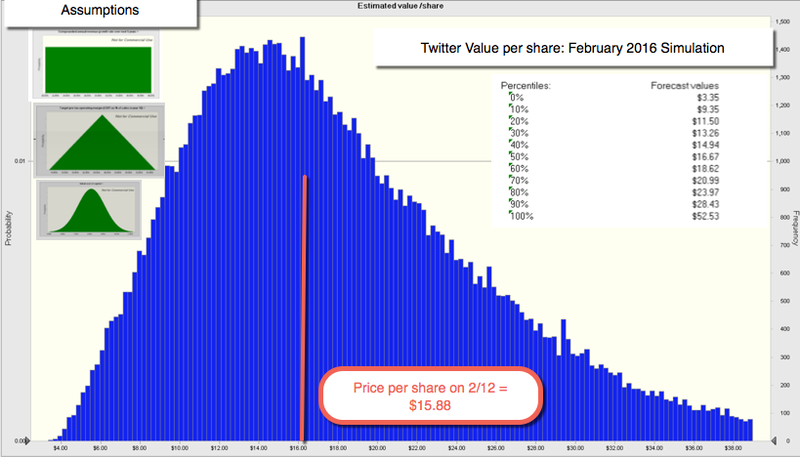 The best that I can say about Twitter, at the moment, is that at $18/share, it is fairly valued, but if the company continues to be run the way it has for the last few years, both price and value could move in tandem to zero. Much as I would like to hold on until the stock gets back to $25, I am inclined to sell the stock sooner, unless the narrative changes dramatically. Valuing Facebook and Twitter after valuing Alphabet is an interesting exercise, since all three companies are players in the online advertising space. At their current market capitalization, the market is pricing Facebook and Google to not just be the winners in the game, but pricing them to be dominant winners. In fact, the revenues that you would need in ten years to justify their pricing today is close to $300 billion, which if it comes entirely from online advertising, would represent about 75% of that market. If you are okay with that pricing, then it is bad news for the smaller players in online advertising, like Twitter, Yelp and Snapchat, who will be fighting for crumbs from the online advertising table. This is a point that I made in my post on big market delusions last year, but it leads to an interesting follow up. If you are an investor, I can see a rationale for holding either Google or Facebook in your portfolio, since there are credible narratives for both companies that result in them being under valued. I think you will have a tougher time justifying holding both, unless your narrative is that the winner-take-most nature of the game will lead to these companies dominating the online advertising market and leaving each other alone. 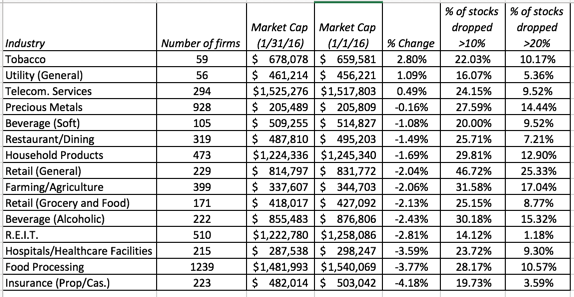 If Google, Facebook and the smaller players (Twitter, Yelp, a private investment in Snapchat) are all in your portfolio, I am afraid that I cannot see any valuation narrative that could justify holding all of these companies at the same time. Closing on a personal note, I have discovered, during the course of valuation, that I learn as much about myself as I do about the companies that I value. In the case of Facebook and Twitter, I have learned that I hold on to my expectations too long, even in the face of evidence to the contrary, and that I under estimate the effect of management, especially at young companies to deliver surprises (both positive and negative). I sold Facebook too soon in 2013, because my valuations did not catch up with the company’s changed narrative until later and perhaps bought Twitter too early, last year, because I thought that the company’s user base was too valuable for any management to fritter away. I live and I learn, and I am sure that I will get lots of chances to revisit these companies and make more mistakes in the future. The Disruptive Duo: Amazon and Netflix! Amazon and Netflix! Need I say more? Just the mention of those companies cleaves market participants into opposing camps. In one camp are those who believe that those who invest in these companies are out of their minds and that there is no way that you can justify buying these companies, perhaps at any price. In the other are those who argue that the old time value investors don't get it, that these companies are redefining old businesses and will emerge as winners, thus justifying their high prices. The truth, as always, lies in the middle. Amazon and Netflix have been market wonders, rising in market capitalization even in 2015, a year when most of the market was retrenching. Notwithstanding the steep drop in stock prices of both companies this year (with Amazon down 23% and Netflix down 22%), Amazon is still up 36% over the last year and Netflix is up 34% during the same period. One simple way to measure how much these companies have to come to dominate their playing fields is to compare them with traditional heavyweights in their businesses, Walmart, in the case of Amazon, and Time Warner, in the case of Netflix. Is it possible that Amazon is worth more than Walmart and that Netflix is more than 60% of Time Warner’s value? The answer is yes and the only way to find out is by valuing both companies. In a post in October 2014, I described Amazon as a Field of Dreams company, with a CEO (Jeff Bezos) who has been remarkably consistent in his push to make the company larger, even if that means selling products and services at cost, or even below, with the objective of using that market power to generate profits later. His vision for the company can be seen in this 1997 letter to stockholders and the company has certainly delivered on at least one half of that vision and increased its revenues in retailing initially, entertainment later and cloud computing recently, while generating little in profits over much of its existence. In its most recent earnings report on January 28, 2016, Amazon delivered its by-now-usual high revenue growth, delivered close to expected numbers on its revenues and guidance, but came in well below expectations on its earnings per share. The market reacted strongly to the earnings per share surprise, with the stock price dropping 15% and Amazon losing $45 billion in market capitalization. The response followed a pattern of large market reactions to earnings surprises at the company, perhaps suggesting that the market is dreaming less about revenues and wanting more in profits from Amazon. 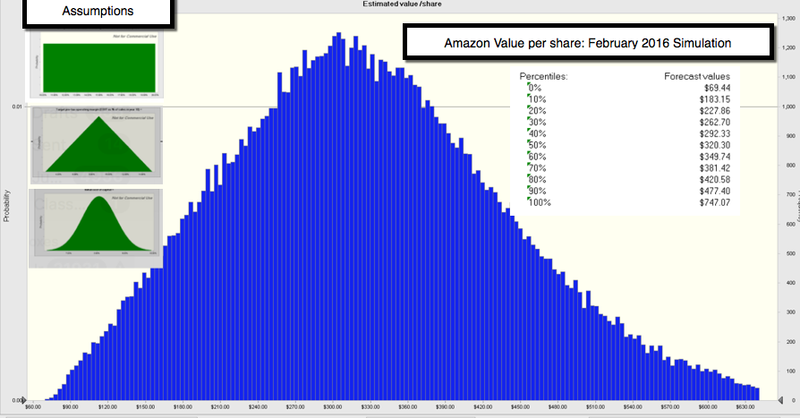 At $507 per share, the price on February 12, 2016, Amazon still looks over valued to me, but as you can see from the simulation, there is a sizeable probability that assuming higher growth and higher margins can get you values that exceed the price. If your rationale for buying Amazon is the cloud computing dream, I would suggest caution. The business is a big, potentially profitable one, but it is also one where other big players are stirring. Netflix: House of Cards or Global Streamer? Like Amazon, Netflix has a CEO in Reed Hastings, who has been both consistent and credible in selling a story of growth and potential. As the company approaches saturation in the US market, the growth story has a global twist to it. In its earnings report on January 19, 2016, Netflix beat expectations on both earnings per share and subscribers, with the growth in global subscribers tipping the scale. While the report initially evoked a positive response, that price bounce quickly faded as investors took profits. At $87.40/share per share, Netflix looks overvalued by about 40%, but as with Amazon, there are clearly combinations of revenue growth and margins that yield values that exceed the price. 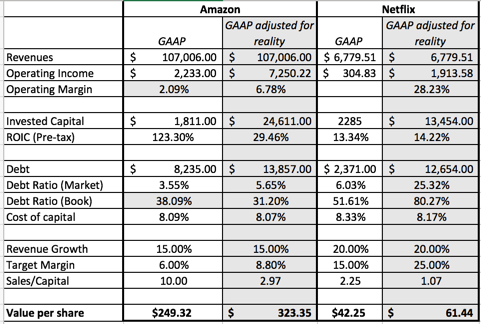 To GAAP or not to GAAP? In summary, reclassifying these basic expenses changes the picture of these companies from low margin companies, that grow revenues with very little reinvestment, to higher margin companies, that reinvest significant amounts to deliver higher revenues. It also has a favorable impact on value per share, not because of the obvious reasons (that operating income is increased) but because the reinvestment at both companies has been value-generating. I don't worship at the GAAP altar and have come to the conclusion that while accountants might do some things well, measuring earnings at companies that are not stable, manufacturing firms is not one of those things. They not only violate their own first principles (as evidenced by the treatment of R&D and contractual commitments as operating expenses) but also create inconsistencies across companies, making earnings at Amazon and Netflix not quite comparable with the earnings at GM or even at Walmart. That is one reason that I give short shrift to arguments against investing in Amazon, because it trades at several hundred times earnings, since cutting its technology development costs by $10 billion could quickly solve that PE problem while destroying the basis for the company's value. As businesses, the two companies share a common characteristic: they are willing to spend money now (on Prime and technology, in the case of Amazon, and original and acquired content, in the case of Netflix) to generate revenue growth, which they believe that they can turn into positive cash flows later. Both companies also realize that their growth ambitions will require them to grow outside the US, in less friendly regulatory standpoint and competitive environments. The biggest danger that the two companies face is that their revenue growth plans come to fruition, but that their costs stay high, as they have to keep spending money to keep their customers. There is one other characteristic that they share and it is one that may add to their value, though it is disquieting, at least to me. I have a feeling that Amazon knows more about my buying habits, and Netflix about my TV and movie watching proclivities, than I do myself. As an Amazon Prime user and Netflix subscriber of long standing, I know that they will use this knowledge to draw me deeper into their web, but I must confess that I am going in willingly. 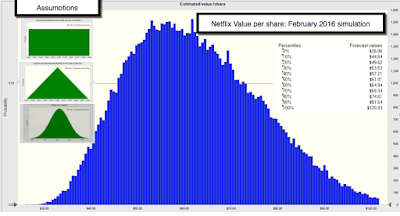 In the first post in this series, I differentiated between investors and traders and no two companies better illustrate the divide than Amazon and Netflix. The two stocks have created a Rorschach test by forcing you to choose between staying true to your investing beliefs or capitulating to your pricing instincts. I would be lying if I said that I have not revisited my Amazon valuation from October 2014, when the stock was trading at about $300 and I found it to be over valued, as the stock doubled to more than $600 during the course of the next year or that I have not looked wistfully at Netflix, during its stock price rise last year. That said, I have made my peace, for the moment, with the market, on these companies. I am an investor, for better or worse, and have to go with my estimates of value, flawed thought they might be, and will not buy either Amazon or Netflix, at their current prices. At the same time, I have enough respect for the power of markets to not sell short on either stock, since I have seen what momentum can do with both stocks. You can call me chicken, but I don't have the luxury of investing other people's money! Apple and Alphabet, the two companies jockeying for the prize of “largest market cap company in the world” are both incredibly successful businesses, with unparalleled cash machines (the iPhone and Google Search) at their core. That said, the last month has been eventful for both companies, just as it has for the rest of the market, as their latest earnings reports seem to suggest that these firms are on divergent paths. Having valued Apple multiple times on this blog over the last five years, and bought and sold the stock based on those valuations, the most recent earnings report is an opportune time for me to revisit Apple’s value. 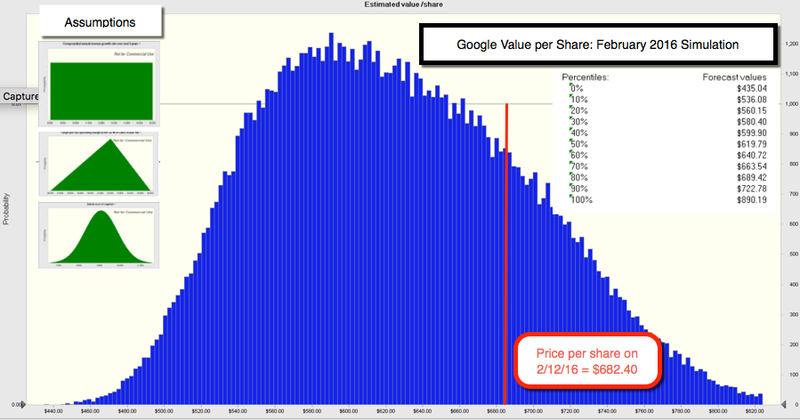 Having never valued Alphabet on this blog, though I have valued it in my classes multiple times, its earnings report is a good time to initiate the process with a valuation. In summary, it looks like the market is weighing the iPhone and guidance bad news far more than the earnings good news in making its assessment, with Apple's history of beating earnings every quarter for the last eight weighing against it. 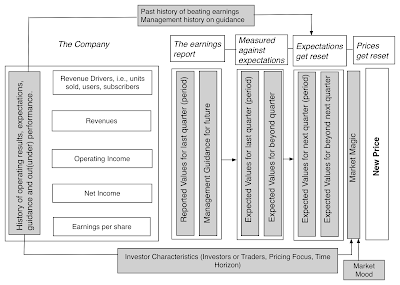 To evaluate whether the earnings report merited the negative market reaction, I went back to the intrinsic value drawing board and updated my valuation of Apple, the last of which I posted in August 2015 and subsequently updated in November 2015, after its annual report (with a September 2015 year end) came out. My assessment of Apple’s value in November of 2015 was $134/share, but more importantly, the narrative that I had for Apple was that of a slow-growth , cash rich company (revenue growth rate of 3% in the next five years and a cash balance of $200 billion), with operating margins under pressure (declining from the 32.03% it earned as a pre-tax operating margin in the 2015 fiscal year to 25% over the next decade) and a very low probability of a difference-making disruption. Looking at the earnings report, it is true that revenue growth came in below expectations (but not by much, given my low expectations) and operating margins dropped, again in line with expectations. At the price of $94 at close of trading on February 12, 2016, Apple looks under valued by about 25% and at least based on my distribution, there is a more than 90% chance that it is under valued. Markets were impressed by both the revenue and earnings numbers and the stock price increased by 8% in the immediate aftermath, briefly leading Alphabet to the front of the market cap race. As a counter to the market's excitement, I decided to compare the narrative (and value) that I had for Alphabet in November 2015 (after their last earnings report) to the narrative (and value) after this one (in February 2016). 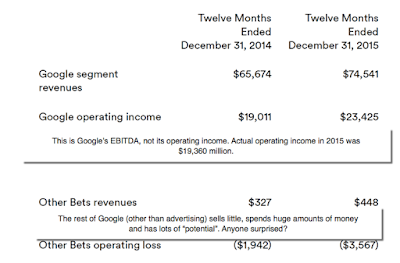 In November 2015, my narrative for Google was that it would continue to be a dominant and profitable player in a growing online advertising market, growing 12% a year in the near term, maintaining its operating margins (left at 30% in pre-tax terms, in perpetuity). At $682.40, the price at which the class C shares were trading at on February 12, 2016, the stock is trading at about 8% above the median price, with a 35% chance of being under valued. Since these shares have no voting rights, attaching a value to voting rights, will make the shares a little more over priced. It became transparently obvious that Google is almost entirely an online advertising company. All of Google's other businesses generate collective revenues of $448 million, while reporting operating losses of $3,567 million. To even call them businesses is perhaps stretching the definition of the word "business", since all they do well, right now, is spend money. While it is reasonable to cut them some slack because they are young, start-ups, there is nothing in this report that would lead you to think about them any differently than you always have, if you were a Google-watcher. It is transparently clear that in spite of its technological sophistication, this company uses financial terms loosely. Note that what the company reports in its earnings release as operating income of $23,245 million in the 2015 fiscal year is really EBITDA, and perhaps the only thanks that we can give is that it is not an adjusted EBITDA. If you are going to be transparent, it is best if you not follow the dictum of Humpty Dumpty in Alice in Wonderland, and claim that a "word is what you choose it to mean". Transparency is good for investors, but with Alphabet, I will reserve my cheers until I see real evidence of it (and perhaps I will, in the full 10Q). If this were a boxing match, Apple and Alphabet would be the super heavyweights, fighting it out for the world championship. To judge which is the better company, though, you would have to specify on what dimension you are making the comparison, i.e., as a business, an investment or as a trade. Apple and Alphabet share a few common features. First, each of them derives their value from one cash cow, the iPhone for Apple and the search engine for Google, that individually have values so large that they would exceed the GDPs of many small countries. Second, both companies are known for their attention to detail and customer focus, at least on their core products, perhaps explaining why they have been so successful over time. Third, both companies have work forces filled with brilliant people who seem to like working for them. In short, these companies are perfect illustrations of how customer focus, employee satisfaction and shareholder value maximization often go hand in hand. Each company, though, has areas where it has advantages. The Alphabet advantage is that its core product, its search engine, enriched with YouTube and the Google ecosystem, requires less care and maintenance to keep cash flows going, with Facebook perhaps being the only threat in the short or the medium term to profits. In contrast, Apple's iPhone franchise requires the company to constantly reinvent the product and make its own prior models obsolete, creating a two-year cycle that is both expensive and gut wrenching to watch. The Apple advantage, though, comes from its history of having survived a near-death experience (in the late 1990s) and reinvented itself. Consequently, the company is much more aware of how tenuous its hold on value is and it does try harder to find new game changers. There is one final difference that, at least at the moment, is working for Alphabet and against Apple, which is that Apple has made China its biggest foreign bet and Google has little exposure to the Chinese economy, thanks to the Chinese government's fear that all that stands between it and chaos is a good search engine. If I were to pick a better business at the moment, it has to be Google. The company's core is strong and will get stronger and the biggest threat it faces, i.e., that the way we look for things may change from search engines to social media sites, is more distant that the the one faced by Apple. 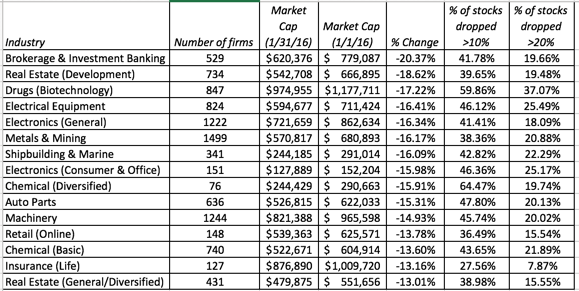 The break even points for the two companies to be fairly priced are wildly divergent. Apple does not need any revenue growth and can see its operating margins slashed by a third and it would still be a fairly valued investment at its current price. 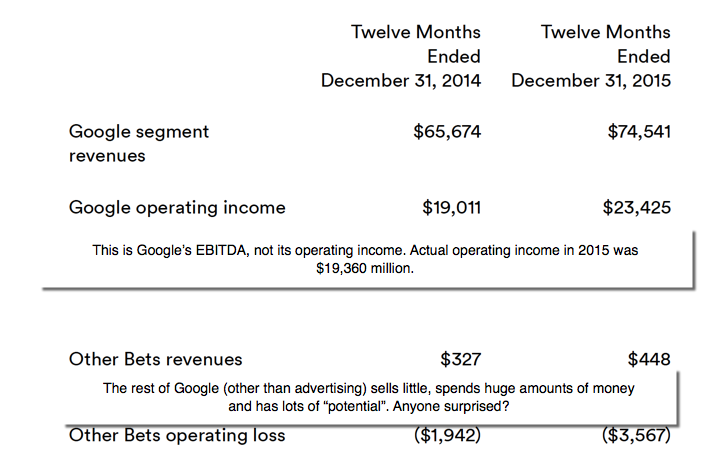 Google will have to deliver 12% revenue growth with its current already high pre-tax operating margin to break even. This may just reflect my personal predilections, but I need a bonus to invest in a company that wants my money but is not interested in my input (my vote on key decisions). I have had my disagreements with Tim Cook, but Apple is a much stronger corporate democracy than Alphabet, which remains a dictatorship, albeit a benevolent one (at the moment). I would hasten to add that I have never owned Google, as an investor, and that may reflect the fact that I continually under estimate the profit-making power of its online advertising engine. So, feel free to download my valuation, change the inputs you don't like and make it your own. If momentum is the biggest driver in the pricing game, it is Alphabet that has the advantage right now, notwithstanding the decline in its price in the days since its last earnings report. Whether fair or not, markets have found the good news in almost every Alphabet story and find the storm clouds even on Apple's sunniest days. As long as the momentum game continues, you will make money far more easily and quickly with Alphabet than with Apple, but just a note of warning, from Apple's own recent past. Momentum will change, almost always without any advance warning and for no good fundamental reason, and when it does, I hope that you are able to get ahead of it. The earnings season is upon us once again, the quarterly rite of passage where companies report their earnings results, the numbers get measured up against expectations, expectations get reset and prices adjust. As an investor, I sometimes find the process unsettling, but as a market observer, I cannot think of a better Petri dish to illustrate both the magic of markets and the vagaries of human behavior. This earnings season has been among the violent, in terms of market reaction, in quite a few years, as tens of billions of dollars in market capitalization have been wiped out overnight in some high flyers. In order to get perspective during these volatile times, it helps me to go back to a contrast that I have drawn before between the pricing and value games and how they play out, especially around earnings reports. The essence of value is that it comes from a company's fundamentals, i.e., its capacity to generate and grow cash flows; you can attempt to estimate that value using accounting numbers (book value) or intrinsic valuation (discounted cash flow). Fundamental information causes changes in a company's cash flows, growth or risk and by extension, will change its value. Pricing is a market process, where demand and supply intersect to produce a price. While that demand may be affected by fundamentals, it is more immediately a function of market mood/sentiment and incremental information about the company, sometimes about fundamentals and sometimes not. In an earlier post, I drew a distinction between investors and traders, arguing that investing is about making judgments on value and letting the price process correct itself, and trading is about making judgments on future price movements, with value not being in play. While the line between fundamental and incremental information is where the biggest battles between investors and traders are fought, it is not an easy one to draw, partly because it is subjective and partly because there are wide variations within each group on making that assessment. For instance, consider Apple, a company followed closely by dozens of analysts, and its earnings report on January 26, 2016. The company beat earnings expectations, delivering the most profitable quarterly earnings in corporate history, but also sold fewer iPhones than expected; the company lost almost $30 billion in market capitalization in the immediate aftermath. An investor valuing the company based on dividends would conclude that it was an overreaction, since not only are dividends not under immediate threat but the cash balance of $200 billion plus should allow the company to maintain those dividends in the long term. A different investor whose valuation of the company was based on its operating cash flows might have viewed the same information as more consequential, especially since 65-70% of Apple's cash flows come from iPhones. A trader whose pricing of Apple is based on iPhone units sold would have drastically lowered the price for the stock, if his expectations for sales were unmet, but another trader whose pricing is based on earnings per share, would have been unaffected. 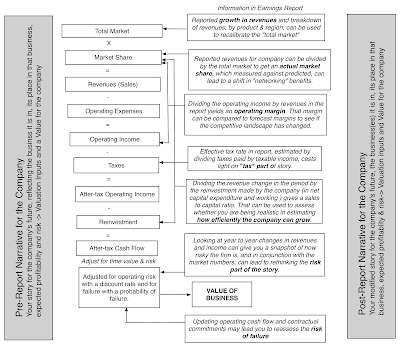 While almost any story (rumor, corporate announcement) can be incremental information, it is quarterly earnings reports that keep the incremental information engine running, as revelations about what happened to a company in the most recent three-month period become the basis for reassessments of price and value. The way traders react to earnings reports is, at least on the surface, uncomplicated. Investors form expectations about what an earnings report will contain, with analysts putting numbers on their expectations. The actual report is then measured up against expectations, and prices should rise if the actuals beat expectations and fall if they do not. The picture below captures this process, with potential complications thrown in. While the game is about actual numbers and expectations, it remains an unpredictable one for three reasons. The first is that the price catalyst in the earnings report, i.e, whether the market reacts to surprises on management guidance, revenues, operating income or earnings per share, can not only vary across companies but across time for the same company. The second is that while analyst expectations are what we focus on and get reported, the market's expectations can be different. The third is that the effect on stock prices, for a given surprise (positive or negative) can be different for different companies and in different time periods. Price Catalyst: It is easy enough to say that if the actual numbers beat expectations, it is good news, but actual numbers on what? 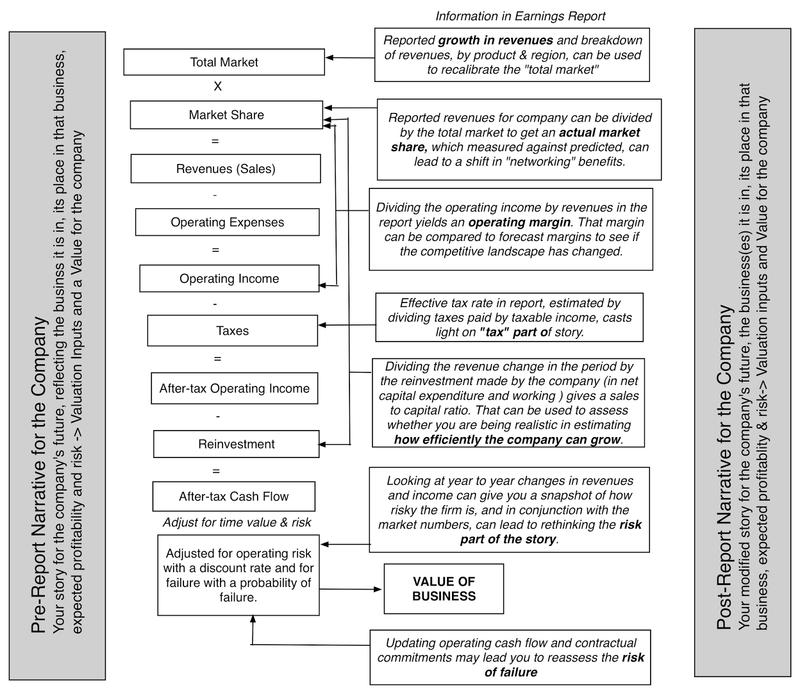 While earnings reports two decades ago might have been focused almost entirely on earnings per share, the range of variables that companies choose to report, and investors react to, has expanded to not only include items up the income statement, such as revenues and operating income, but also revenue drivers which can include units sold, number of users and subscribers, depending on the company in question. In the last decade, companies have also increasingly turned to providing guidance about key operating numbers in future quarters, which also get measured against expectations. Not surprisingly, therefore, most earnings reports yield a mixed bag, with some numbers beating expectations and some not. Thus, Apple's earnings report on January 26, 2016, delivered an earnings per share that was higher than expected but revenue and iPhone unit numbers that were lower than anticipated. Whose expectations? News stories about earnings reports, like this one, almost always conflate analyst estimates with market estimates, but that may not always be correct. It is true that analysts spend a great deal of their time working on, finessing and updating their forecasts for the next earnings report, but it is also true that most analysts bring very little new information into their forecasts, are overly dependent on companies for their news and are more followers than leaders. To the extent that companies play the earnings game well and are able to beat analyst forecasts most or even in all quarters, the market seems to build this behavior into a "whispered earnings" number, which incorporates that behavior. Effect of surprise: The market reaction to a surprise is also unpredictable, passing through what I call the market carnival or magic mirror, which can distort, expand or shrink effects, and three factors come into play in determining that image. The first is the company's history on on delivering expected earnings and providing guidance. Companies that have consistently delivered promised numbers and provided credible guidance tend to be cut more slack by markets that those that have a history of volatile numbers or stretching the truth. The second is the investor base acquired by the firm, with the mix of investors and traders determining the price response. On a pricing stock, it is traders who dominate the action and the market response is therefore usually more volatile, whereas on a value stock, it is investors who drive a more muted market reaction. The third has less to do with the company and more to do with the market mood. In a month like the last one, when fear is the dominant emotion, good news is oft overlooked or ignored, bad news is highlighted and magnified and the price reaction will tilt negative. 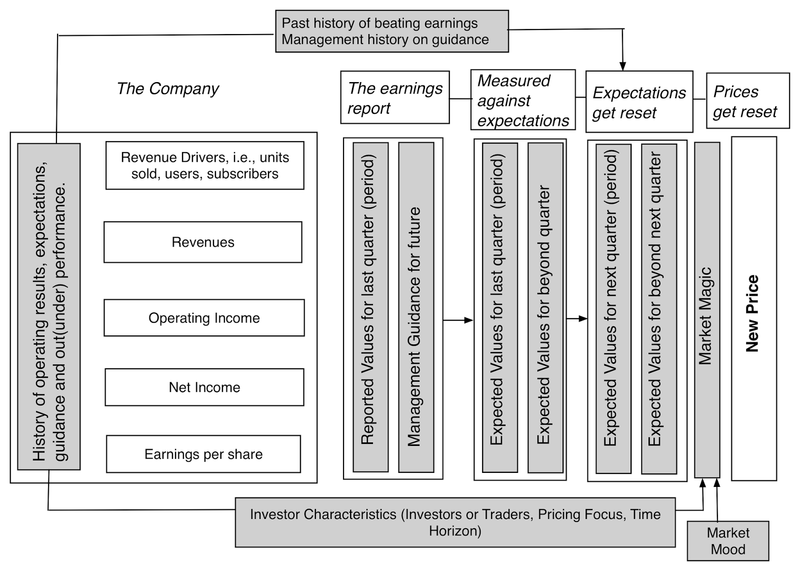 An earnings report can cause big change in value: For an earnings report to significantly affect value, a key part or parts of the narrative have to be changed by an earnings report. This could be news that a company has entered and is growing strongly in a market that you had not expected it to be successful in or on the flip side, news that the market that you see it is in is smaller and/or growing less than anticipated. Big value changes are more likely in young companies: These significant shifts in value are more likely to occur with young companies than where business models are still in flux than with more established firms. Consequently, you should not be too quick in classifying a big price move on an earnings report as a market overreaction, especially with young firms like GoPro and Linkedin. There is more to an earnings report than the earnings per share: The relentless focus on earnings per share can sometimes distract investors from the real news in the earnings report which can be embedded in less publicized numbers on product breakdown, geographical growth or cost patterns. If you believe, like I do, that investing requires you to constantly revisit and revalue the companies that you have or wish you to have in your portfolio, new earnings reports from these companies provide timely reminders that no valuation is timeless and no corporate narrative lasts forever. This post has gone on long enough, but it will be the first in a series that I hope to do around earnings reports, built around four topics. Make it real: In the first set of posts, I will be looking at a few companies that I have valued before. I will start by looking at two companies, dueling for the honor of being the largest market cap company in the world, Alphabet (Google) and Apple, seemingly on different trajectories at the moment. I will follow up with Amazon and Netflix, two firms that are revolutionizing the entertainment business and were among the very best stocks to invest in last year. In the third post, I will turn my attention to two social media mainstays, one of which (Facebook) has unlocked the profit potential of its user base and the other (Twitter) that has (at least so far) frittered away its advantages. In the final post, I plan to pay heed to two high flyers, GoPro and Linkedin, that have hit rough patches and lost large portions of their value, after recent earnings reports. The Players: In the second set of posts, I will first focus on investors and traders and how they might be able to play the earnings game to their advantage, often using the other side as foil. I will then examine how corporations can adapt to the earnings game and look at different strategies that they use for playing the game, with the pluses and minuses of each. The Government/Regulators/Society: In the final post, I will play a role that I am uncomfortable with, that of market regulator, and examine whether as regulator, there is a societal or economic benefit to trying to manage how and what companies report in their earnings reports and the investor reaction to these reports. In the process, I will look at the debate on whether the focus on delivering quarterly earnings diverts companies from a long term focus on value and how altering the rules of the game (with investor restrictions and tax laws) may make a difference. If you have been tracking the posts that I have about my data updates, you probably noticed that early on, I had planned eight posts but that this shrunk to seven by the time I was done. The reason was that the last post that I was planning to make was going to be on pricing numbers, i.e., the multiples that companies are trading at around the world, relative to book value and earnings. 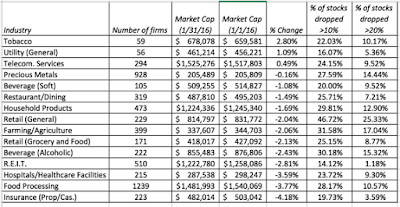 However, as the market dropped in January, I decided that posting the PE and EV/EBITDA multiples from January 1, 2016, would be pointless, since the numbers would be dated. I was also considering a post on the stock market turmoil during the month, and during the weekend, I decided that I could pull off a combined post, where I could look at both the pricing on January 1, and how it has changed during January 2016, by region, country and sector. The ERP rose about 0.60% (on both measures) during the month to peak on January 20, though it dropped back again in the last few days of the month. It is true that I left the cash flows and growth periods unchanged over the trading days, and that the bad news of the month may reverberate, with lower buybacks and growth expectations in the coming months. thus, the increase in the ERP is exaggerated, but, in my view, the bulk of the change will remain. The essence of a crisis month, like this one, is that the price of risk will increase during the month. The Five Trillion Dollar Heist: Who did it? The global equity markets collectively lost $5.54 trillion in value during the month, roughly 8.42% of overall value. The global breakdown of value also reflects some regional variations, with Chinese equities declining from approximately 17% of global market capitalization to closer to 15%. To the question of how the month measures up against the worst months in history, the good news is that there have been dozens of months that delivered worse returns in the aggregate. In fact, the US equity market's performance in January 2016 would not even make the list of 25 worst months in US market history, all of which saw double-digit losses or worse or even the 50 worst month list. As you can see in the pie chart, the pain was not inflicted equally across the world. China was the worst affected market and the details of the damage by region are captured in the table below. Not only did mainland Chinese stocks lose more than 20% of their market capitalization, more than 75% of all stocks in that country dropped more than 10% and 59% dropped by more than 20%; Hong Kong listings fared a little better, but still managed to come in second in the race for worst regional market. Indian and Japanese stocks were hard hit, but the rest of Asia (small Asia) did not do as badly. Among the developed markets, Australia was the worst affected but the UK, US and EU regions saw market capitalizations drop by 6-7%. If you are a knee-jerk contrarian, you may be tempted to jump into the Chinese market, especially since mainland Chinese stocks traded at 15.73 times earnings, on January 31, 2016, down from 20.28 times earnings at the start of the month, and Hong Kong based Chinese stocks look even cheaper. In the global heat map below, you can look up how stock markets fared in each country during January 2016 and pricing multiples at which equities are trading at the end of the month. The biggest surprise, given the news about continued drops in oil prices, is that none of the oil groupings (I have four) showed up on the list, with integrated oil companies dropping only 4.20% and oil distribution companies dropping 8.93% during the month. Not surprisingly, there are a host of cyclical companies on this list, but biotech and electronics companies also suffered large drops in value. Looking at the fifteen industries that fared the best during the month, tobacco topped the list, as one of the three industries that managed to post positive returns, with utilities and telecom services being the other two. Precious metals did well, reflecting the tendency of investors to flee to them during crisis, but most of the rest of the list reflects industries that sell the essentials (food and household products, health care). As investors, we often feel the urge to extrapolate from small slices of market history, and I am sure that there will be some who see great significance in the last month's volatility. They will dredge up temporal anomalies like the January effect to explain why stocks are doomed this year and that if Denver wins the Super Bowl, it is going to be catastrophic for investors. I am not willing to make that leap. What I learned from January 2016 is that stocks are risky (I need reminders every now and then), that market pundits are about as reliable as soothsayers, that the doomsayers will remind you that they "told you so" and that life goes on. I am just glad the month is over! 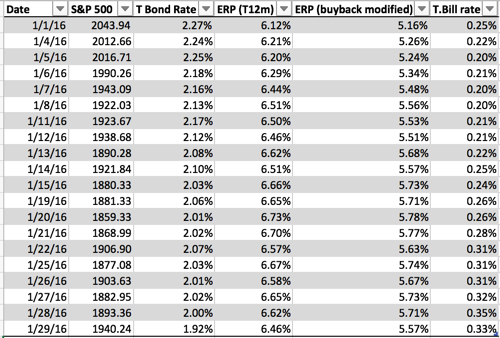 ERP by day for the S&P 500 with ERP spreadsheet, if you want to do it yourself.